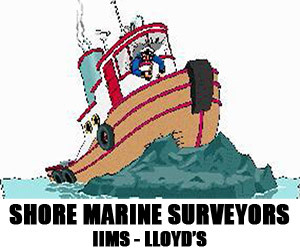 A Marine Surveyor is someone who has proven to some national or international maritime authority, society or association that they are qualified to adequately inspect a boat and report on its suitability for an intended purpose and or to assess the market value of a boat based on its condition. The marine surveyor's primary role in the maritime industry is to help to ensure safety of boats at sea in respect of lives and property. The Philippines does not currently have any recognized authority to specifically certify marine surveyors to inspect and assess Pleasure Boats. Qualified Philippine marine surveyors generally act for clients based on their experience of inspecting and assessing commercial vessels and or cargoes. Before you agree to pay a fee to a marine surveyor, it is wise to check the currency of his or her certification and or accreditation. This can usually be accomplished directly through the corresponding Authority, Association or Society website. Specializing in surveys for small ships: insurance surveys, pre-sale surveys, engineering surveys, damage surveys, end of warranty surveys, marine investigations etc. Buying a boat? engage a qualified Marine Surveyor. A qualifed marine suveyor can potentially save you the embarassment and expense of buying a boat only to find out, shortly after purchase, that the you or the seller overlooked some not-immediately-obvious defect that causes you to spend days or weeks without the use of your new boat. A qualified marine surveyor will provide you with a detailed report, describing the condition of the boat and a list of things that you will need to addressed in the foreseeable future. A marine surveyor will charge you (as prospective buyer) a fee for his or her services that will most likely be in the range of US$1,000-$1,500 (depending on the size of the boat and its location). You cannot expect these fees to be deducted from the eventual purchase price but the information obtained during the survey may provide you with some points of negotiation that could encourage the boat seller to significantly reduce his or her asking price. Alternatively, the marine survey may provide a complete validation of the seller's asking price and this will give you the confidence to make the investment. A seller will usually agree to a marine survey if he or she feels confident that such a survey will support their asking price. Assuming this happens, you will also be responsible for paying all costs associated with getting the boat to a suitable place of survey. The "costs" will include, but may not be limited to: the cost of crew to deliver and return the yacht; the costs of yard facilities - required if the boat is to be lifted out of the water; and, any additional insurance required for the boat to be moved to the survey location. As a prospective buyer, you can expect to pay a downpayment on the boat before the survey process can commence. You can choose to provide a successful buyer with a copy of the survey report, the fees for which can be recovered within the final contract price. Need to insure your boat? premiums will be lower with a current survey report. Insurance companies, especially in the Philippines, are wary of insuring privately owned boats because private boat owners frequently economize on replacement parts and on maintenance. In fact, there are less than a handful of Philippine insurance companies who will provide insurance for privately owned boats. If you have a current marine survey report then you will find insuring a private boat is much easier and less expensive than without. If you have already insured your boat and it is involved in an incident then a marine surveyor will probably be required to assess the damage and costs of rectification. If you are a marine surveyor and wish to advertise here please email: details, an image file (300 x 250 pixels or larger) and your contact details to webmaster(at)pgyc(dot)org. Note: there is a modest, annual listing fee of US$75 for posting your advertisement.